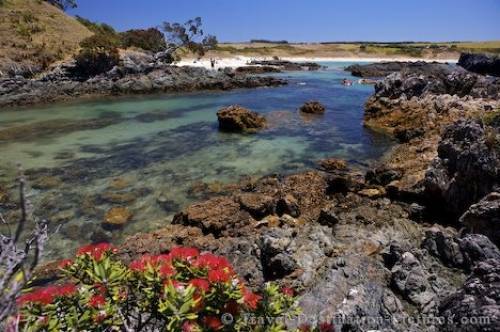 Northland is often dubbed the Winterless North by the locals and it's just that fact that makes Maitai Bay a popular location for a vacation on the North Island of New Zealand. With a campground nearby and a combination of rocky and sandy shorelines, Maitai Bay is a gem in the Northland region of New Zealand. Bright Pohutukawa Trees lining the shores of a small cove at Maitai Bay on the Karikari Peninsula, East Coast, Northland, North Island, New Zealand. Maitai Bay on the Karikari Peninsula, Northland, New Zealand.